Martha Kimes grew up in small Midwest towns before heading off to New York City to attend Columbia Law School. After practicing law for nine years as a litigation associate at a large New York City law firm, she moved back with her family to Arizona, and took a position as in-house counsel to the Make-A-Wish Foundation of America. With all this, Martha found time to author Ivy Briefs: True Tales of a Neurotic Law Student - a memoir of her journey through law school from first-year grades to bizarre job interviews and bar exam insanity. The book was published by Simon & Schuster on May 15. For those who enjoyed One L, Ivy Briefs is worth reading. 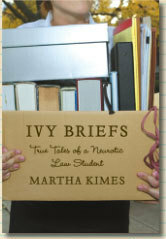 Learn more about Ivy Briefs on Martha's website.